Great staff. Reasonably new...Review From Modern Messagesubmitted by Evan H. - Apr 11, 2019 |Recommended: YesGreat staff. Reasonably new appliances. Everything has been good so far. The only complaint I have is we need more visitor parking spaces. There are over a hundred people who live here I assume and there are 10 visitor spaces. Paint the spaces in front of the catholic center visitor so the friends of residents don't get towed. 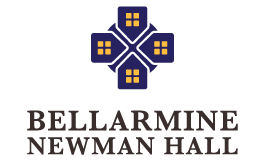 Bellarmine Newman Hall is p...Review From Modern Messagesubmitted by Alejandra A. - Apr 09, 2019 |Recommended: YesBellarmine Newman Hall is pretty great I only wish it had a bit more visitor and regular parking spaces. Other than that, the pool, gym, and hang out spaces are awesome. Outstanding service so far....Review From Modern Messagesubmitted by Akash P. - Mar 28, 2019 |Recommended: YesOutstanding service so far. Even though I have not yet started living there, the staff and the apartments itself look very nice compared to a lot of the other ones available. It is in a nice area that i...Review From Modern Messagesubmitted by Darren V. - Mar 20, 2019 |Recommended: YesIt is in a nice area that is walking distance from campus. The apartments have nice newer style rooms for students. So far the residents seems like they are friendly people. response from property - Mar 20, 2019 Hi Darren! Thank you for the amazing review! We cannot wait to see what next year holds! Bellarmine Hall is a nice p...Review From Modern Messagesubmitted by Brya*@*.Com - Mar 09, 2019 |Recommended: YesBellarmine Hall is a nice place to live. Staff is very friendly as well. Definitely the cheapest place that's this close to USF for apartment style living. The environment is very fri...Review From Modern Messagesubmitted by Thanh N. - Mar 03, 2019 |Recommended: YesThe environment is very friendly. It is not noisy and the place is very clean. It is also across the street from USF so it is convenient for students. Living at Bellarmine is not...Review From Modern Messagesubmitted by Christopher K. - Feb 13, 2019 |Recommended: YesLiving at Bellarmine is nothing short of a great place to live. With a nice facility, friendly residents, and a perfect location right on the edge of campus. I really like to live here,...Review From Modern Messagesubmitted by Matheus P. - Feb 06, 2019 |Recommended: YesI really like to live here, really good location, quiet place with a really nice neighborhood. Really good for students at a great price. The apartments are really good. This hall is amazing. It’s ...Review From Modern Messagesubmitted by Taylor L. - Feb 06, 2019 |Recommended: YesThis hall is amazing. It’s quiet, the staff is nice, and it’s close to campus The price is also reasonable, which is nice for broke college students.